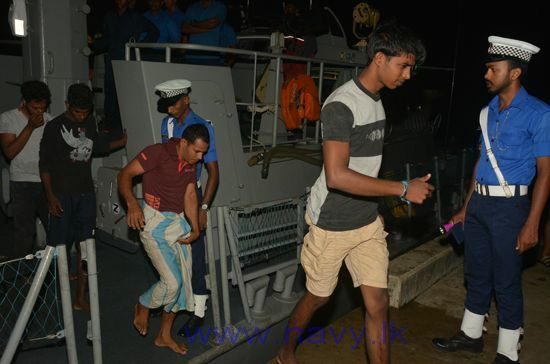 Aug 16 (NIA) – The Sri Lanka Navy, on Tuesday, apprehended 18 Sri Lankans, who were attempting to flee to Australia illegally by boat, in the seas off Batticaloa, in the eastern part of the island nation. The navy media unit said that naval officers managed to seize the migrants on a tip off received by intelligence personnel and the suspects were brought to the Trincomalee Harbour. Subsequently they were handed over to Criminal Investigation Department, Maritime Division for onward investigations. “The Navy warns the general public not to involve in high risk sea-borne migration to Australia based on false information provided by human smugglers,” the navy said in a statement. “Further, the Navy reminds of its strong network of intelligence and regular patrols put in place to nip such illegal migration efforts in the bud as the country is very strict with illegal migration attempts,” the navy added. Several Sri Lankans attempting to migrate illegally by boat to Australia are arrested each year as the Sri Lankan navy maintains a strict surveillance in its seas. Asylum seekers have attempted to reach Australia on boats from Indonesia, often paying large sums of money to people smugglers. Many have died making the dangerous journey.